Inviting Anaheim hotel reminds one and all not to miss the last chance to be dazzled at Disneyland® Resort’s 60th Anniversary Diamond Celebration ending September 5th, 2016; welcomes “Frozen – Live at the Hyperion” to Disney California Adventure® Park. Hampton Inn & Suites Anaheim Garden Grove, a Disneyland® Resort Good Neighbor Hotel, welcomes one and all to experience the magic of Disneyland® Resort 60th Anniversary Diamond Celebration one last time before it ends on September 5th, 2016. The Diamond Celebration features “Paint the Night” parade, “Disneyland Forever” fireworks and much more. Guests looking to be wowed with delicious food will find delicious lemon-flavored Diamond Celebration cupcakes and amazing drink choices, made just for the Diamond Celebration. Disneyland® Resort doesn’t disappoint, with new updates to rides and the launch of “Frozen - Live at the Hyperion”. The musical adapted from the 2013 Walt Disney Animated Studios movie draws guests in with a theatrical skill that enthralls one and all. Guests can experience both the Diamond Celebration and “Frozen – Live at the Hyperion” together, only through September 5th, 2016. When staying at a Disneyland® Resort Good Neighbor Hotel, guests can be assured of the quality of the hotel and the close proximity to the Disneyland® Resort. Hampton Inn & Suites by Hilton Anaheim Garden Grove doesn’t disappoint, with free daily breakfast, a heated outdoor pool, great location- just one mile from the Park, and shuttle service to and from the Disneyland® Resort for a small fee, as well as complimentary Wi-Fi throughout the hotel. The hotel offers king and queen rooms, suites and accessible rooms, all available upon request, based on availability. For more information or to make reservations, please visit http://www.hamptoninnanaheim.com or call (714) 703-8800. 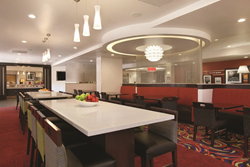 Hampton Inn & Suites by Hilton Anaheim Garden Grove hotel is proudly managed by Stonebridge Companies in Denver, Colo.